My son doesn’t want to sit near me. He doesn’t want to ride in the car with me. He hardly notices I am even there. And I am thrilled!! I mentioned in my tryouts post that my oldest tried out and made the JV Volleyball team. This has been a great experience for him, and for us. Where he was traditionally a quiet, very reserved type he has come alive with stories from practice and goofing off with the team. He has really come out of his shell and it has been great for his attitude and demeanor. Not to mention getting a lot of exercise and being involved in a sport for the first time in a while. But perhaps most notable is his independence. He has confidence and he is willing to branch out on his own. We have been able to attend all of his games so far and it is great to see him being part of the team, even though as the youngest member of the group he is sitting on the bench most of the time. He is determined and focused during warmups and assumably during practice, while so far during the limited game time he gets he looks pretty nervous. That is to be expected. 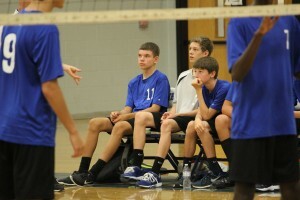 After the JV games the JV squad is expected to watch and cheer on the Varsity team. Rather than coming to sit with us, he hangs with the team and takes part in the cheering and chants. He gives us a glance here and there and at times has passed along a quick “thumbs up” but is otherwise content to hang with his team. And we think this is wonderful. For away games he rides to and from the game on the bus, even though we are there and could give him a ride home. He enjoys the camaraderie on the bus with the JV and Varsity guys having fun. Granted, it means we drive from the school we are visiting back to the High School just to pick him up but it is good for him to participate and feel involved. And the team seems to be a good group of guys- the Varsity guys even cheer for him when he goes in. So for now, when he avoids us at games, we are happy. This experience has caused him to open up more to us and added a level of confidence to him overall. He talks more to us at the dinner table and has a lot to say whenever he gets our ear. In many ways it has made us our relationship better, and that can’t be praised enough. It has been a great experience all around so far.